We compare and contrast two players with matching ADPs. Which ones should you target? I’m a list guy. I make “to do” lists, follow “honey do” lists, and will take time to read a top ten list of almost anything. 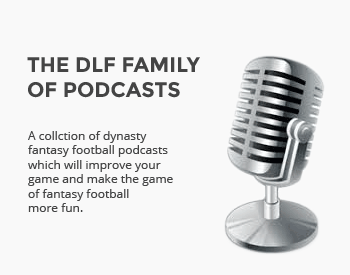 This series of articles will bring you a top-five ranking on a myriad of topics in the world of dynasty football. With our brand new dynasty ADP data recently hitting the site, I wanted to take a closer look at some ADP Twins, pairs of players with the exact same January dynasty ADP. These are clearly players our dynasty community values similarly, but which is the right choice when participating in a startup draft? I’ve covered this topic before, sharing my own opinion of how I value the two specific players and ultimately, which I would choose. This time, I added another wrinkle, polling my Twitter followers, and the results were very surprising. It is obvious that Saints running back Alvin Kamara has been one of the top stories across all dynasty leagues this season and his value has skyrocketed, making him a fringe first-round pick in new leagues. A player headed in the opposite direction is Falcons veteran receiver Julio Jones, who despite a very respectable WR7 finish in PPR leagues, is losing dynasty value as he nears his 29th birthday. Each player found themselves near the end of the first-round in January’s dynasty ADP, but I suspect their trade value varies greatly. That is shown in the poll results, which were dominated by Kamara in runaway fashion. Personally, I am torn on this one as I typically build my teams around wideouts, but also target young players. While I have some slight concerns about Kamara’s ability to maintain his out of this world efficiency numbers as well as his lofty dynasty value, I have to take the dynamic back who can do it all for one of the best offenses in the league over the weekly frustration that stems from Jones’ red zone usage. I would trade back if faced with the last 2 pairs. Bet these results drastically change two weeks into the season, as long as the paired veteran player is off to a solid start. This happens every year. Selling production for cheap in the offseason when everyone is looking for youth and picks. Buying back production in the middle of the season when almost everyone is focusing on winning. Have to try to not get caught up in it. I don’t see the connection between your comments and the pairs cited. Kamara and Hill had great production plus youth. Henry and Watkins both question marks, and I don’t like comparing QBs to skill positions so the last two are a waste.